With colourful shop windows, golden beaches and turquoise waters, and an extremely zen town mentality, there are very few places that can compare to the hippy town of Byron Bay. 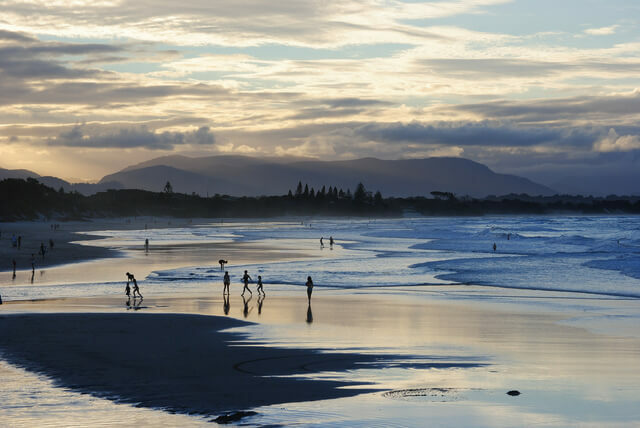 A favourite on every east coast Australia road trip, Byron Bay truly is one of a kind. It boasts glorious beaches, an amazing chilled out atmosphere, enough bars and restaurants to keep you fed and watered for weeks, and beautiful surroundings. 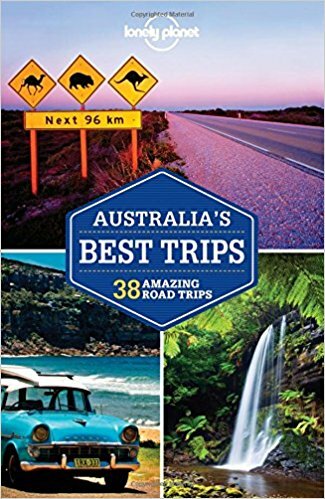 But there are a couple of things you should know before visiting this captivating town in northern New South Wales, which will ensure you make the most of your time in the town and see the very best of Byron Bay. At first, it seems strange that half the population of Byron Bay walks around barefoot. 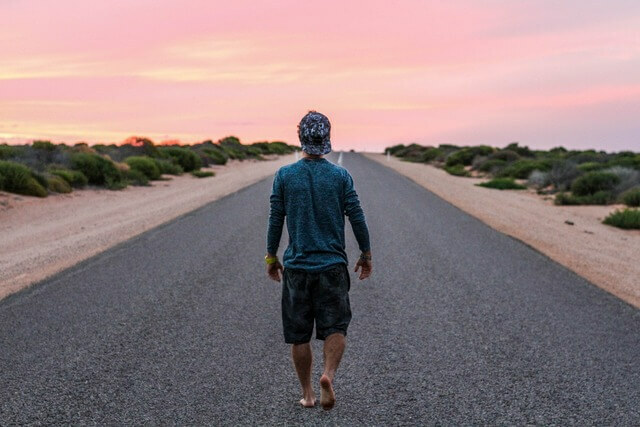 Of course, walking on tarmac roads without shoes isn’t for everybody, but if you’ve ever wanted to ditch your trainers or thongs (Australian for flip flop, by the way! ), and feel a connection to the earth by walking barefoot, it certainly won’t be frowned upon in Byron Bay. Yes, the beaches in Byron Bay are stunning – but so many travellers forget to visit its glorious hinterland. Dotted with spectacular waterfalls and quirky towns and full of dense rainforest, a day trip out from Byron to see some of the wonders inland is a must. If you don’t have your own transport, you can either hire a car in Byron Bay, or join a tour that visits Nimbin and Minyon Falls. Many think that Byron is too far south for anything spectacular under the water – and it’s true that the Great Barrier Reef finishes some 650 kilometres north. But under the oceans of Byron Bay, there’s an amazing mix of tropical fish and animals such as sharks, turtles and dolphins. I saw seven leopard sharks at once while diving and it was an awe-inspiring experience! 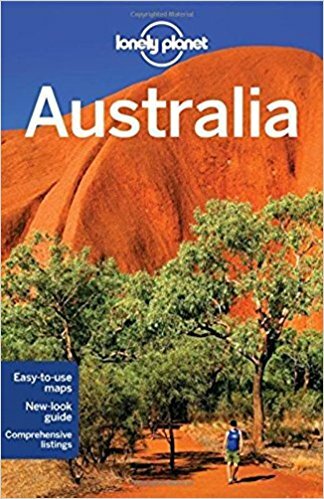 Many travellers fear visiting Australia because of the amount of deadly animals in the country. 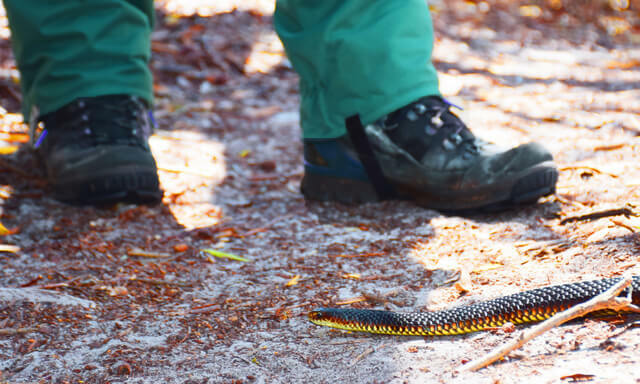 While many people spend a year in Australia and don’t see any snakes – if you stay in Byron, particularly if you’re near the forest which is situated just out of town – it’s likely you’ll see some. They’re mainly pythons, which aren’t deadly, but all sorts of other snakes have been reported. But it’s important to remember that snakes don’t attack unless they feel threatened – if you keep your distance from any sighted snakes and don’t try to pick it up, it will slither off and leave you in peace! If there’s one thing that is worth getting up at 5am for, it’s a Byron Bay sunrise. 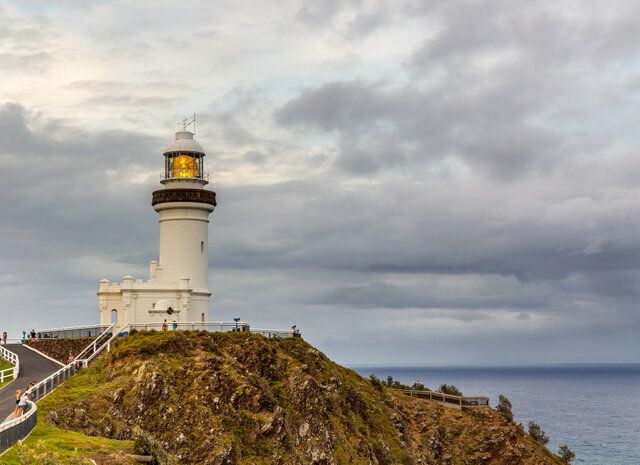 Byron Bay’s lighthouse is the most easterly point of the mainland of Australia, meaning that you’ll catch the sun before anywhere else in Australia, and it really is a spectacle. If you’re catching the sunrise in the winter months, you might see wales migrating from the lighthouse as well! Byron’s not the kind of place where you pay for entertainment. Above Main Beach in the afternoon or evening, there’s often fire spinners, amazing singers or other entertainers. The beach is a great spot to hang out to see some of the town’s resident talent. You could also head to the Arts Factory Hostel’s weekly talent show, held every Tuesday night, where amazing singers and entertainers take to the stage. This is a serious warning; Byron Bay steals people’s hearts. While living there, I heard countless stories of people who had visited for a weekend, and ended up staying for months… it’s the kind of place that is impossible to pull yourself away from. But, if you have the means to stay there for an elongated amount of time, then why not stay? Time in Byron Bay is never wasted! 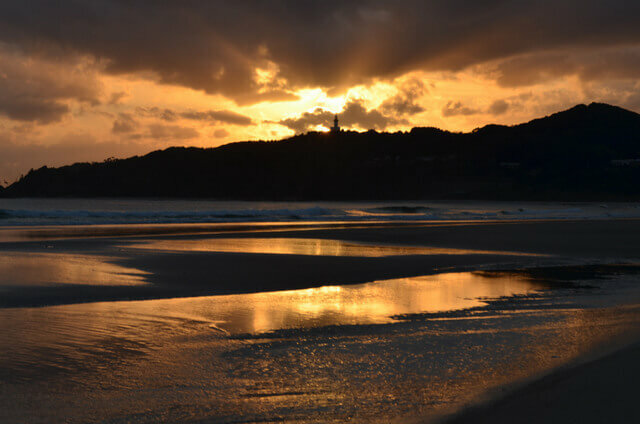 When it comes to Byron Bay Australia, there are plenty of things to do, like the beach, shops, life, lighthouse. 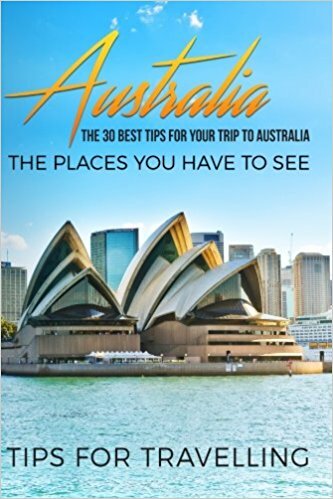 But there are a couple of things you should know before you travel here. Click to read more. Claire Martin is a British travel blogger and freelance writer. 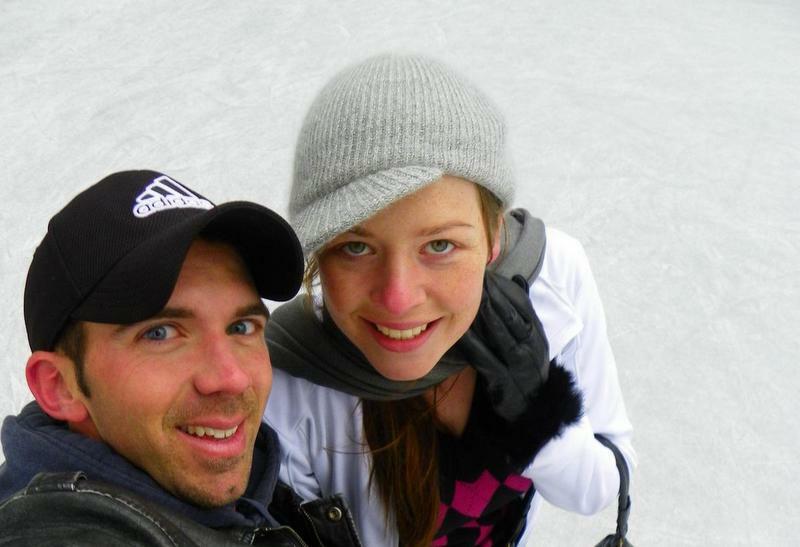 She blogs about eco-travel and overland adventures on her blog Claire’s Footsteps, recently having driven around entirety of Australia, and currently planning an overland trip through Asia. Follow her adventures on Facebook or Instagram. Excellent advice Claire. Love how you can barefoot it around Byron Bay no probs. I rarely walk barefoot but tire of the uptight lands like my native US where walking barefoot is largely frowned upon, save by beaches. What’s the big deal? Folks walk barefoot here in New Zealand regularly. Maori, whites, anybody LOL. I saw a dude walking barefoot through the airport in Christchurch yesterday. Ain’t no thing. Love it. So glad you enjoyed the post Ryan :) I know, I don’t know what the big deal on being uptight with shoes is either – the world has become so safety conscious and politically correct, especially in the US where it seems like people sue for everything. This is the first time I am reading a post about Byron Bay and the place definitely deserves a place on my bucket list, Meg. Walking barefoot sounds like lost of fun! Yes, Byron Bay is a very tempting place to stay and settle down. Unfortunately, over the last 2 decades, it has suffered from its own popularity. House prices and rents have skyrocketed. We were forced to move into the hinterland, to lovely Mullumbimby. This place is sooo on my dream travel list. 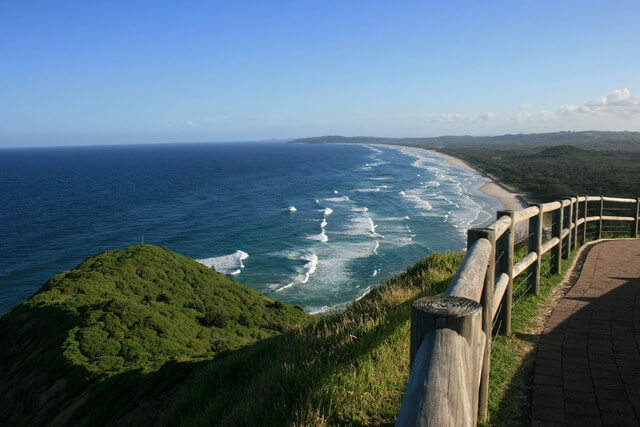 Byron Bay really is a wonderful place you don’t want to miss when you visit Australia. Absolutely Louise – glad to hear you’ve had a fabulous time in Byron too!